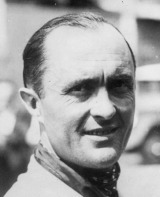 Louis Chiron's racing career spanned over three decades, from 1923 to his final grand prix in 1958. In 1956 he created a record unlikely to be beaten when, aged 55, he guided his Lancia to a sixth place finish at Monaco, becoming the oldest man to finish a championship grand prix. Three years later he became the oldest man to take part in a grand prix, failing to finish at the same circuit. In World War One his driving skills had already been recognised and he was chauffeur to Marshal Foch, the commander in chief of the Western Front. Afterward the war he became a garage owner in Nice, and his initial years in racing were funded by a succession of prudent relationships with wealthy women. His career stalled in 1933 when he was sacked from the Hoffman team for having a well-known affair with the owner's wife, and soon after Bugatti also dumped him. He subsequently drove for Ferrari and Mercedes Benz. He retired in 1938, but made a comeback after the war and showed his skill was undiminished with two wins in the French Grand Prix. In 1949 came an incident that was to tarnish his reputation. On the eve of the Monte Carlo Rally he accused female driver Hellé Nice of being an agent of the Gestapo during the war. The allegations were completely unproven but ruined Nice's life and she died in abject poverty. By the time the F1 World Championship was launched in 1950 Chiron was too old, even though many of the leading drivers were over 40. That year he managed third place in his native Monte Carlo, his best championship result, but in 1951 he drove an uncompetitive Lago-Talbot and that spelled the end of his remaining chance of glory. In 1954 he was still good enough to win the Monte Carlo Rally with Ciro Basadonna. In retirement he was an executive with the organisation running the Monaco Grand Prix. His statue stands next to the circuit and one of the corners is named after him.